Dr. Lindyke's Blog: A New Throne. OK, in the past I've recommended other stuff... a keyboard and pedals, an electronic drum kit, open source recording tools... but it occurred to me that I've neglected my tuchus. Instead of a decent, comfortable seat, I've been using a cheap $15 folding barstool from Wal-Mart that is frankly the wrong height, and feels like you're sitting on the edge of a split-rail fence. I took care of that today. Professional drummers and pianists spend a lot of time sitting down, and so do I. The right seat can make a big difference in the quality of your performances... if you're uncomfortable, or you're awkwardly positioned, it shows. I'm not a great fan of piano benches, though, and prefer to use a stool. 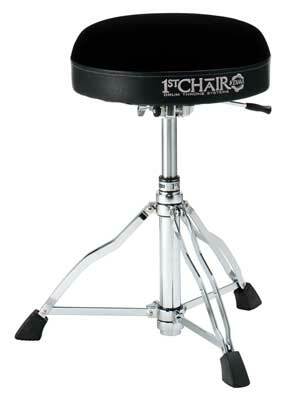 The drum set also requires a stool, or throne, though at a different, usually much lower, height. The seat has to be comfortably padded, easily adjustible, and incredibly sturdy. I was in Hames Music today, and on semi-impulse started looking for a stool to cradle my bruised buns. I wound up selecting the Tama HT650C Round Rider Hydraulix drum throne. That's a mouthful, so I'll call it the Round Rider. It's everything I mentioned above, and the cloth seat is very comfortable. It's extremely easy to adjust using the side lever, it height ranges from higher than I need to lower than I need, so it covers all the bases, and it dis-assembles and folds up tight for easy transport. Those heavy-duty footpads mean that once placed it's not going anywhere. It's double bracing has the feel of precision engineering, and it doesn't warp or creak. There's a manually adjustable version of this same stool, but the difference in price is only about $20. Given that you're spending well over $100 for this stool, I saw no reason not to spring for the hydraulics. If you're a dedicated pianist or drummer who rarely needs to adjust the height, then you may be fine with the manual "screw adjust" type. A chair is a very personal thing, but I'm sharing because I like this one a lot.